Welcome to the first stop aboard this special edition of the Magical Blogorail. Enjoy the ride as we take you through a year of Walt Disney World special events. This edition, I get to share with about one of my personal favorite special events: Marathon Weekend! I think I've known for a long time that WDW annually hosted a marathon and some races. But, I never really knew how big the events were until I finally experienced them this past January. Right past the holiday rush, Marathon weekend is usually the 2nd weekend (Thursday through Sunday) in January. Starting on Thursday with a multi-day expo, runners and spectators can learn about running products, shoes, gear, nutrition, clothing, and just about anything you could possibly imagine is available for runners. The expo can be quite over whelming, but invigorating and fun to walk through. Beyond the expo, held at the ESPN Wide World of Sports, the kids races start up Friday morning (though there is a second day of kids festival on Saturday morning) offering races for crawlers, toddlers, and kids up to a 1 mile run run. Also on Friday is a family 5k, allowing families to run together, even pushing strollers. My son, Noah, just 13 months "ran" in a 100m dash, which was absolutely adorable. They had entertainment performing, dj's going, and family events and even seminars on nutrition for kids and adults alike! We didn't stay around for the rest of the event after Noah's race, b/c it was lunch (and nap) time, but there were hundreds, if not thousands, of people swarming around Mickey's Kid's Fest. The following day, Saturday, was the big day for us: The WDW 2011 Half Marathon! 13.1 miles running from EPCOT, through the Ticket and Transportation Center, through the Magic Kingdom, and back through and out of EPCOT. Along with 27,000 other racers, my husband and I ran our first mile together, than parted ways. He ran for himself, and I ran to meet characters and enjoy such an amazing experience. I stopped for several photo ops, including Mary Poppins and Tiana and Prince Naveen from the Princess and the Frog. Sunday concludes the racing events - the full marathon. 26.2 miles, through all 4 parks. . And about 500 of the 20,000+ racers ran the 26.2 after completing the 13.1 mile half marathon the day before, completing the "Goofy Challenge." These races are open to the public and, in my opinion, doable for just about anyone. In fact, at the airport on our way down, I talked to a 79 year old man planning to run the half marathon for his 5 year in a row! With a 16 minute-mile pace requirement, with some training, you could even walk the course! The following day is now known as Marathon Monday. Those who complete the full marathon are awarded with a 1 day entry into the park. And, as I learned, not much of a better time to be in the parks, as the crowds are at a minimum and the temperatures are, in my mind, perfect. If you're curious about how I got started running, I've got several articles here about how I started and I also share some of my running tips (from the pros!) 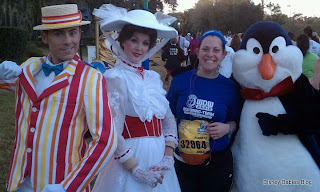 over at Chip and Co., including my personal favorite on how Disney made me a runner. Thank you for joining me today, talking about one of my favorite aspects of Walt Disney World! Your next stop on the Magical Blogorail Loop is Disney on Wheels, talking about Epcot's Flower & Garden Festival. Your son running in the dash is priceless. Might have to sign our son up for next year. Very cool! My husband was thinking of doing the 2012, but he's had a lot of health issues this year. Maybe 2013! These runs look so much fun - but I just can't get myself motivated to take up the sport. My son on the other hand loves running events; maybe I can convince him to sign up and we'll come to cheer. Looks like so much fun. I would love to participate someday. That is the most adorable photo of your son! Hmm...wonder if I can talk the grandparents into doing a combo marathon/vacation! great post and great memories!! I'll never forget my first and only (so far) full and half marathons at WDW!! Unfortunately, I have two bad knees so no marathons for me. Looks like you had a lot of fun.